I don't see why that should be the case, it's been closed for over four years. 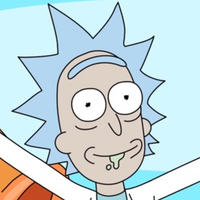 Rick has put up with enough rip-off artists trying to make a quick buck from his source code. Well my opinion of the project just dropped significantly. And, I'm not sure why you think being open source is so important. It's irrelevant. Anyway this is a thread for discussing the paint.net 4.0 alpha build 5086. It is not an open source philosophy thread. Bezier curves are in, I just implemented them. They were quite easy -- I had simply just forgotten about them! 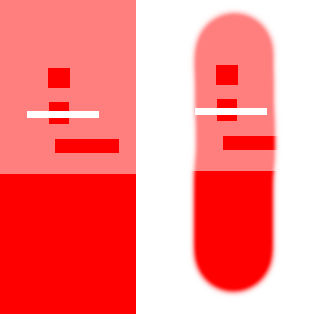 It will show up as another shape type. Line, Spline, and Bezier are distinct shapes, in other words. Thanks a bunch for putting those back in. And, I'm not sure why you think being open source is so important. You crack me up Welshy! may you find some of them need not only to me. shift does not work with all the axes of the ball, to be honest I would like to back former Rotate / Zoom layer. I always use the Bezier curve, and could simply not do without it. So thank you for putting it back in. He forgot about them, they're already implemented and will be back in the next release. If you're referring to the transparency of the primary or secondary color: confirmed. Cloning with t=255 primary or t=10 primary color does not make a difference. Works for me, recoloring 255-red with 255-blue results in blue, recoloring with 128-blue results in purple = 255-red+128-blue (if you meant that). Undo of which action, because I tried a few and it works for me. Confirmed. Set Hue to greenish and track saturation to the left - hue will "shivver" a bit and finally pop to red on the left. * Sliders DO affect the ball, but the second slider's value (rotation axis angle) is invisible unless you set the third slider (rotation angle) to any value other than 0. * The only negative value you cannot set is the rotation angle, which is unnecessary. You can pan the image from 0 to 90 degrees, together with the rotation axis angle that can be set from -180 to 180 degrees that makes a fully configurable feature. Example: set the third slider to 45; this will pan your image so that the right half goes into the background. Now track the second slider to 180 (or to -180) to make the left half go to the background. * Controlling the ball is as easy as it used to be for me. What are you trying to do you're having troubles with? * Shift works with the two main axes, not sure if that is intended or a bug. please read this, Cloning with t=255 primary or t=10 primary color make a difference! Tutorials - Publishing ONLY!→ Miscellaneous → "Faking Soft Brushes and the Blur/Dodge/Burn Tool"
On the 'Color' layer, fill in your desired color. Take out the Clone Stamp and set your reference point on the color layer. (And hide the color layer while you're at it) Now for the interesting part: Set your primary color alpha value to something lower. The exact setting depends on your brush size and how 'soft' you want your brush to be. For the sake of example, I've shown different alpha values at the same brush size (70). To give you an idea of what you can do. If your alpha value is too low, there won't be any effect at all. Remember that. Go to the Brush Layer, line up with the reference point*, and start painting away! Works for me, recoloring 255-red with 255-tran results in blue, recoloring with 128-blue results in purple = 255-red+128-blue (if you meant that). Adjust the tolerance ... ? I found the way that leads to a crash. 1. 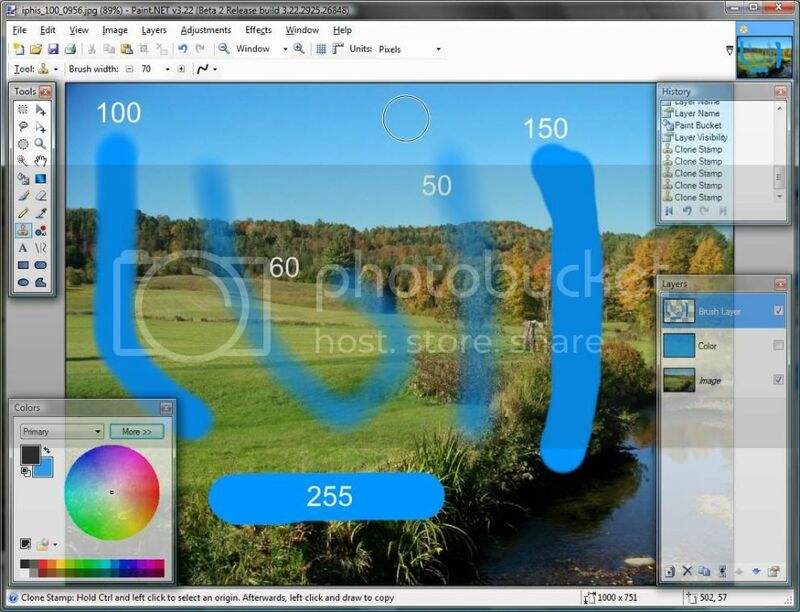 Select an arbitrary area of ​​the canvas (eg tool "Rectangle select"). 2. Select the tool "Move Selected Pixels". 4. Ctrl+Down (or Up, Left, Right). 5. Ctrl+D (or V, X, possibly also other combinations result in a crash). An important point: if you press the second key combination is after displayed the dotted line, the program will not crash. Pressing keyboard shortcuts, Ctrl+Down (or Up, Left, Right), long processed! P.S. This machine translation, I hope the meaning is clear. I should have mentioned - freshly typed text, on it's own layer - so there's only the text on the layer. 50% tolerance always worked in 3.5 ? Can you give me the image so that I can try to reproduce it? Great build, but I am noticing some minor issues. Firstly, in the "Colors" form when "Primary" is selected or clicked from the color sample/preview all controls that will change the color work but when "Secondary" from the drop down box or clicked from the color sample/preview it will immediately review to "Primary" and change the primary color instead. Finally, in the text tool "Strikeout" when checked will not actually strikeout the text but instead underline it. I have tried it on numerous fonts but still it will not apply the effect. Even when bold is checked it will still not apply it to the editable font. For flood fill, delete, text, gradient or shape it works. For pencil, clone, brush, eraser and recolor it doesn't. So obviously, this bug only applies to the mousedrag-tools. That's why I asked I used gradient, select, delete and fill and it worked nicely. Locking since I'm about to put out a new build.